Rozaan and August had a winter wedding, also with a burgundy colour scheme, but this time it was hosted by Pont de Val. They too had a hanging structure above the Main Table creating a focal point in the venue. Their wedding flowers and décor featured navy napkins and gold under plates together with the burgundy flower runners, and they had naked bulbs beneath their hanging structure adding additional focus to the Main Table. Congrats guys, and here’s to a wonderful future together. Photos courtesy of Van Luke Weddings. Doing the wedding flowers and décor for this special couple was not only a privilege, but truly a pleasure. A sweeter couple you would be hard to find!! As this was a winter wedding Ané chose burgundy – a strong, bold colour to bring warmth to her wedding flowers and décor. The Nutcracker was filled with protea table runners from one of the room to the other and if that wasn’t enough – they featured in the hanging structure above the Bridal Couple’s table as well. We repeated the burgundy colour scheme through the use of burgundy napkins and brought extra twinkle and romance in through hanging loads of lanterns from the beams in the reception hall. Love to you both, with best wishes. Photos courtesy of Frank and the Misses Photography. When two owners of an artificial lawn business get married – then one just has to incorporate the artificial lawn somewhere in the Wedding Flowers & Decor, and that’s exactly what we did! Instead of a “red” carpet in the Chapel, Cherese and Willie had a “green” carpet. This, together with all the candles in the Chapel brought light and warmth. Wishing you both great success with your business and a future filled with much love and laughter. Photos courtesy of In-Style Photography. 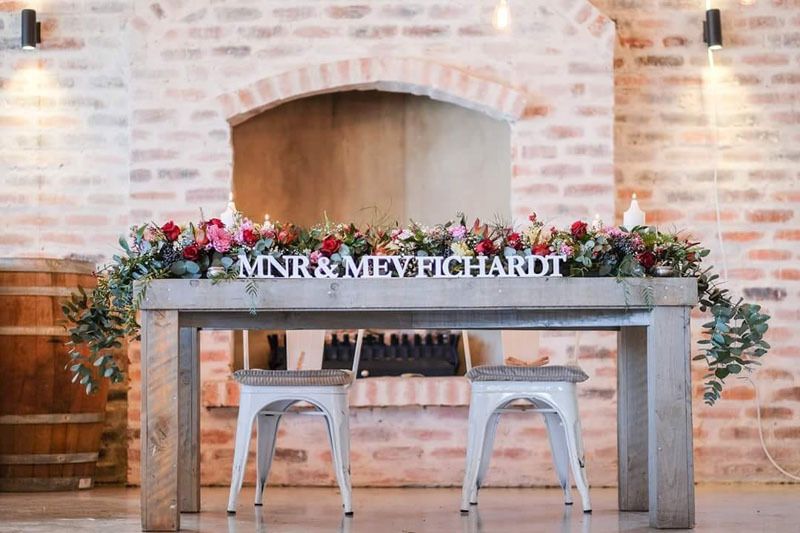 Bahri Wedding Venue was the obvious choice of venue for Debbie and it suited her theme of banqueting-style table set-up with flower runners featuring gnarled wood and burgundy flowers just perfectly. Wishing you and Travis a very happy marriage and all the best for the end of the year!! Nadia and Jaco – what an amazing couple with an amazing story. Thank you Nadia for the coffee and chat in Parys – it was fabulous to learn your story and be able to put together what your dreamed of for your wedding flowers and décor. The Nutcracker roof beams were decked with loads of hanging lanterns which twinkled beautifully through the evening and the tables were dressed with flower runners of pennygum and white roses. Classic and stunning! Juanita’s love for proteas and Fynbos was reflected in the wooden boxes of flowers on the tables at The Nutcracker. Hope you guys had a super wedding and made special memories of a super weekend in Parys. 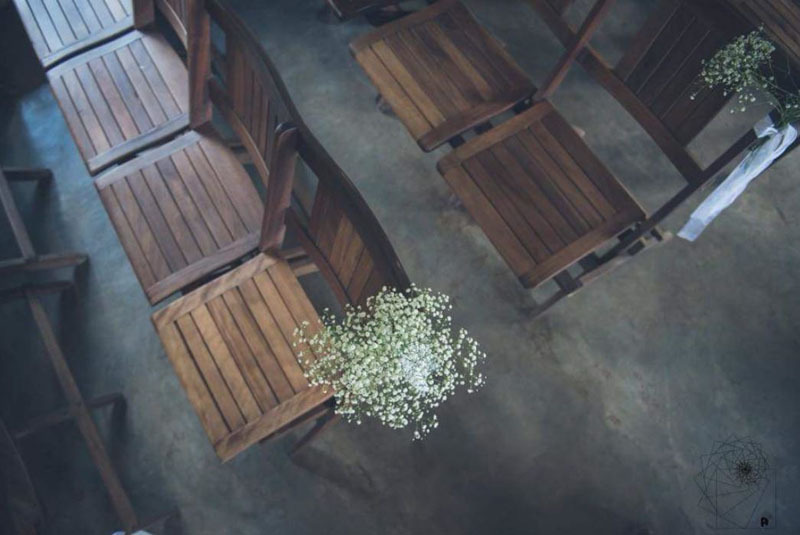 Photos courtesy of A Square Wedding Photography. Mariska – it was a pleasure working with you and planning your special day. I am so glad our paths crossed and it was truly an honour being part of your special day – you are a very special person with a huge heart. 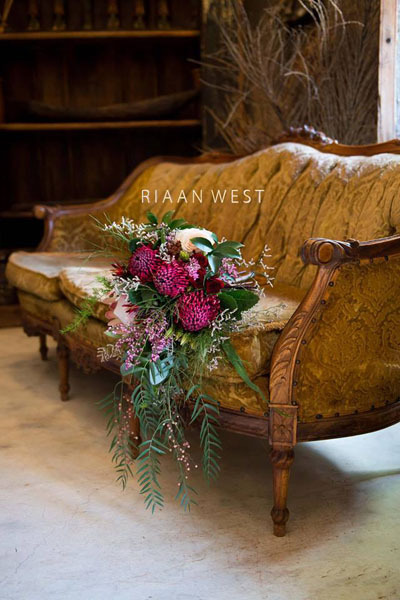 Mariska and Riaan got married at The Nutcracker and to tie in Riaan’s love of hunting, we used shotgun shells for the men’s corsages and Mariska’s love of everything” unbalanced” – every table was just that – unbalanced with nothing matching!! Photos courtesy of Riaan West, Cape Town. Montague Vale was where Riane and Shaun got married. The colour-scheme – mauve and the what I loved most was the intimacy of this special occasion. Very close friends and family celebrated with this special couple who have now emigrated so it was a bitter-sweet celebration!! Special thanks must go to Johan (the chef for the evening) and Thea (for quite the most drop-dead gorgeous “sweets” selection). Riane – your dress was drop dead gorgeous! Hope you both made special memories of a very special day to take with you in your hearts on this exciting new experience. Hope France is all you dreamed it to be and loads more…. Photos courtesy of Jalien Rayneke. Aimee and Ricardo chose The Nutcracker for their big day. A glorious day at the end of February with a colour scheme of burgundy, and a “Table for Two” main table. Thank you to my Flower Angel, Denise for your hard work on this project!! What a great couple with tremendous energy. Thank you Aimee for all the months of hard work and planning – it was fabulous working with you – wishing you both a tremendously happy marriage together. Photos courtesy of JC Click.